November | 2012 | Beer Apprentice - Craft Beer News, Reviews, Interviews and Info. Hi guys. For today’s craft beer review I’m going to try the Organic Apricot Ale produced by the Samuel Smith’s Old Brewery (Tadcaster) located in Tadcaster, England. I’ve never tried this particular Samuel Smith’s brew before. I do favor a lot of their products however, so I’m eager to try it. From the website, samuelsmithsbrewery.co.uk, we find this description. Ok. Let’s give it a taste. This brew came in an 18.7 oz. bottle and it had an ABV of 5.1%. It poured a hazy orange juice type of color with a soft, frothy, somewhat creamy, white head. It was nicely sized and the retention time was fairly decent. The lacing was solid. It left nice rings of foam after each and every sip. The nose presented a sturdy waft of apricot. It was very clean, fresh and sweet smelling. Hints of wheat and bread added some complexity. It does smell an awful lot like fruit juice to be honest. The taste released a very, very strong characteristic of juicy apricot. A little too much for me actually. It was very sweet and just a tad bit tart. I even found it to be a touch sugary. Some wheat, yeast and bread hid underneath, which tried to tame that sweet, fruity juice taste, however it had a hard time. Thus the flavor became a touch one dimensional I thought. The mouthfeel was medium bodied. It was smooth, although quite crisp too. Very dry with a pleasing amount of medium strength carbonation. A good dose of flavor was left behind on the palate after each sip as well. Overall, I thought this beer was “ok”. Not horrible by any means, but I doubt I go searching for another bottle anytime soon. I could tell it was well made, but it just had a bit too much sweetness and apricot for me. That in and of itself made it somewhat difficult for me to drink. It would be worth a try I guess. Summertime might be the best time to sample it though. 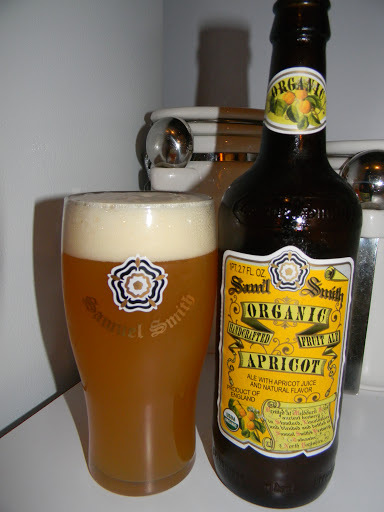 Have you guys ever tried the Samuel Smith’s Organic Apricot Ale? What was your experience like? Be sure to leave me a comment and tell me all about it. Hello everyone. For today’s craft beer review I’m going to be giving the Jester King Wytchmaker brewed by the Jester King Craft Brewery located in Austin, Texas a try. Let’s just go ahead and get to the website, jesterkingbrewery.com, and see what kind of information we can drum up about the Wytchmaker. This brew comes in a 25.4 oz. bottle and it has an ABV of 7.3%. It poured a hazy, deep golden/orange color with a few shimmers of some brighter orange highlights around the edges and through the middle. The crowned formed to a very nice size and it was white, fluffy, soft and semi-rocky. The retention time was excellent and the lacing was more than sufficient. It was a very attractive and inviting looking beer. The bouquet dispensed a compelling hoppy profile. Very citrusy with hints of grapefruit and orange. It gave up a light caramel malt as well as a little bit of yeast and some rye breadiness. The funkiness was very subtle, however it did reveal a trace of lemongrass after it opened up and was allowed to breathe a bit. A small waft of spice was discovered too. I’m guessing that may have been from the presence of the rye. 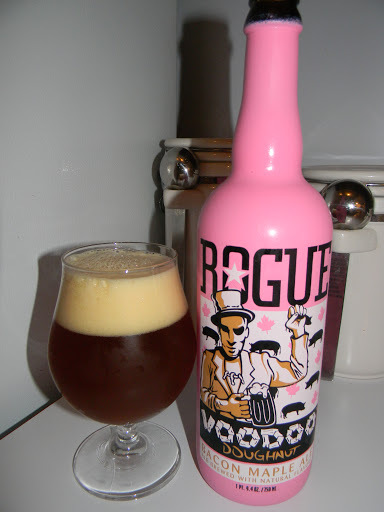 The taste was a well balanced and semi-strong blend of the citrus and bready funk. Again, bits of grapefruit, lemon and orange intermingled with fresh grassy tinges. Spicy rye bread, yeast and very subdued caramel malts gave the savor a pinch of roundness. Solid to the bone with the flavor. The mouthfeel was medium bodied. Mostly dry, crisp, refreshing and thirst quenching. It wasn’t as dry as some of the other Farmhouse beers I’ve tried in the past, but it was still dry enough. The carbonation was lively and “bitey”. A sturdy dose of flavor was left behind after each gulp as well. Overall, I found this beer to be very nice and I liked it very much. Easily one that I would have no problem picking up again. I would love to have this brew during the Spring or Summer. I think it would be ideal once the temperature outside started to rise, however I do believe that I could enjoy it no matter what the weather. The drinkability was outstanding. I killed this bottle in no time flat!!! I’d definitely recommend the Jester King Wytchmaker if you have yet to do so and if you can procure a bottle. If you like Farmhouse/Saison styled beers, I think you may enjoy this one immensely. I know I did.